99% of the world’s wine does not need cellaring. Most wines are in fact at their peak the day they are released. You also need to consider that almost every bottle of wine is purchased either the day it is intended to be consumed, or shorty thereafter. However, a small amount of great wine is produced that ages and improves with age and proper cellaring. The aging and cellaring of those wines are the focus of this article. Wine is a living thing. It changes with time in the bottle. Depending on the wine, it can take from years to decades for the molecular structure to change. But changes do occur from cellaring wine. If you have any doubts about this, simply open a young bottle of wine along with the same wine from a previous vintage, perhaps from 15-20 years ago and you can easily see, smell and taste the difference. If you are going to seriously collect wine, properly cellaring of your wine is imperative. Wine has been aged and cellared for thousands of years. At first, wine was stored large jugs or amphora. For cellars, the Romans stored wine in the catacombs. However, it was not until the marriage of the glass bottle and cork, which took place during the 1600’s, that the aging and cellaring of wine began in earnest. Prior to the wide spread use of the cork, bottles were stopped with at first rags and later glass stoppers, which were made one at a time to seal each bottle. This was in the age when bottles were also made by hand, one at a time. The birth of the modern age changed all that. You do not need to engage in cellaring wine to enjoy it. The truth is, most people like the taste, fragrance and texture found in young wine. There is nothing wrong with that approach. All wine appreciation is a matter of personal taste. I love a lot of young wine. For example, 2009 Bordeaux from many producers, especially from the various satellite appellations are already quite tasty. Some of the best wines from Pomerol and St. Emilion in 2009 have also been stunning since the day they were released. I adore young Chateauneuf du Pape as well as many of the best wines from the Napa Valley in California. Sauternes in its youth is one of the great taste treats available. Yet, at least for my palate, they all fall by the wayside when a properly cellared and aged wine is available. Today, with our fast paced, instant world where everything takes place quicker than ever before, the concept of buying and cellaring wine to drink 10, 15, 20 or more years later is an archaic concept to most people. There are countless inventions in the marketplace all claiming to age a wine in minutes, right before your very own palate. Trust me. They do not work. There is no substitute for time. That is why the auction marketplace places such a massive premium on properly cellared Bordeaux or other wines. People buying those wines understand that with time, a wine becomes more than what it was when it was originally placed in the bottle. Older, properly aged and cellared wine is more than bottled history, although there is value in the history discovered with aged wine as well. Fortunately, the best producers of age worthy wine are making wine that requires less time in the cellar these days. One hundred years ago, almost no new, oak barrels were used to age wine before bottling. This produced wine, especially in the best wines from Bordeaux that demanded decades before the tannins were soft enough to allow for a correct, let alone great wine tasting experience. The wines were just too hard and tough to drink in their youth. In Bordeaux today, most of the top producers use from 30% new, French oak barrels to 100% new, French oak, during the aging process of their wine. Grapes all over the world are picked today at greater levels of ripeness in the fruit, and when possible, skins, seeds and the tannins, giving a softer, rounder feel to the wines. This allows consumers to enjoy their wines with less cellaring than the previous generation of wine lovers. There is an ongoing conversation, or argument about the ability of today’s Bordeaux wine to age as long as it did for previous generations. In my opinion, Bordeaux wine today not only will age just as well as it did for previous generations. Bordeaux wine today is also enjoyable at a much younger age, satisfying the demand from new consumers with a lack of patience. But this is a complex issue that requires its own article. The key to aging wine and cellaring wine is temperature control and humidity, along with a lack of light and vibration. Regardless of the type of wine, and the size of your cellar, those four points are your sole concern. Wines with the ability to age and evolve into something greater than its youth are rare and expensive. Depending on the wine and vintage, it could take years, or often decades for the wine to reach maturity. With that in mind, it is imperative to cellar your wine correctly. You cannot control the conditions the wine was shipped in. Although today, any serious importer takes the correct amount of care in seeing that the wines reach the stores in good condition. But you can control how the wine ages and evolves once you have accepted delivery. What is the right temperature to store and cellar wine? Keep in mind, wine is a living thing. Temperature is an important, if not the paramount concern when aging and cellaring wine. The colder the temperature, the longer your wine will take to mature, while increasing the lifespan of your wine. 55 degrees Fahrenheit, 13 degrees Celsius, is considered the optimum temperature for long term aging. At 55 degrees, your wine will enjoy a long, slow evolution. At warmer temperatures, your wine will develop faster and enjoy a shorter life. However the simple act of raising or lowering the temperature does not necessarily increase or decrease the rate of maturity in your wine. If that was the case, you could simply have a warmer cellar and your wines would reach maturity quicker. The rate at which hydrolysis, meaning the chemical reactions take place when aging a wine adds to the level of complexity in the wine. In fact, it has been proven that increasing the temperature in your cellar will have an adverse reaction in the quality of your wine. I have tasted more than enough aged wines to know warmer cellar temperatures are detrimental to the development of wine. The old saying patience is virtue is what aging wine is all about. 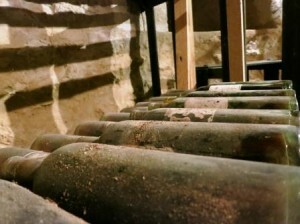 There are two types of wine cellars used for cellaring wine; active and passive. An active cellar is one where the temperature is controlled by a mechanical device. A passive cellar is when the temperature rises and falls with the change of the seasons. The best passive cellars are most often, underground allowing for constant cold or cool temperatures. Change in temperature is not a bad thing for wine, unless it happens at a rapid pace, which could loosen the seal of the cork. This takes place due to the rising and falling levels of liquid in the wine bottle which directly impacts the ability of the cork to retain its seal. When the integrity of the seal is lessened, the increased amount of oxygen allowed to enter bottle quickens the rate of evaporation in the wine bottle. The transference of oxygen into a wine is a potentially important aspect to the wine aging properly. After all, the cork is porous as is the glass bottle to some extent. It’s the rate of the transference of oxygen that counts. Slow and steady is how the best wines are meant to age. Wines for extended cellaring should be kept in cooler temperatures. Preferably close to, or under 60 degrees Fahrenheit. As we already mentioned, 55 degrees is considered the optimum environment for cellaring wine. If you are as an example only planning on cellaring wine for a few years, temperatures closer to 65 degrees should not be a problem. However, if you just purchased a case of 2010 First Growth Bordeaux and plan on opening a bottle after 30 to 40 years, colder temperatures close to 55 degrees is going to provide you with the optimum cellaring environment. Why is humidity important to cellaring wine? The need for humidity in the process of cellaring wine is an often argued and debated point. Inside the bottle, the level of humidity is 100%. 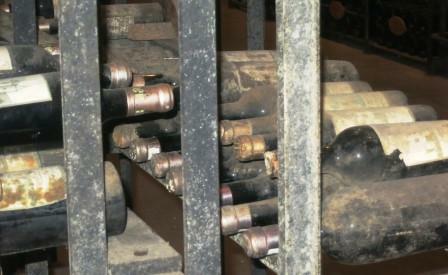 Shouldn’t the act of laying a bottle on its side provide enough humidity for the purpose of cellaring wine? The simple answer is yes. Sort of. That is because the humidity inside the bottle only protects the portion of the cork that is closest to the wine. The humidity also keeps the top of the cork as well as the portion of the cork not in touch with the wine in its proper moist condition. This helps the entire cork retain its elasticity and seal. Bottles with better cork seals are less likely to develop ullage. Ullage is the space pocket between the cork and the wine. The smaller the ullage, the better the wine, because with less space between the cork and the wine, there is less air in the bottle to cause unwanted oxidation. Personal experience and anecdotal evidence proves that the freshest, youngest tasting wines at maturity come from wine cellars with humidity that hovers between 70% and 80% humidity. There is no problem with higher levels of humidity for the cork or wine. In fact, that could be beneficial to both the wine and the cork. However, increased levels of humidity can destroy the labels affixed to the wine. If you are planning on selling your wine, that is going to be a problem, as bottles with damaged labels bring less money. If you are cellaring your wine to maturity for personal pleasure, it will not make a difference. Does light and vibration matter when cellaring wine? Light and vibration are both enemies of wine. Strong light can alter the wines delicate chemical makeup. That is the reason for the dark, green glass used most often for red wine. White wine is not normally aged as long as red wine, which is why the wines are placed in clear or lighter colored bottles. Strong light can also radiate heat, which can also hurt the correct development of a wine. Vibration is another potential problem. Unwanted vibration could cause chemical reactions that might cause your bottles to develop differently than what is beneficial to your wine. A few other tips for you when deciding on cellaring wine. If you are buying a full case of wine and it comes in the wood, store it in the wood if you like. The wood case can last longer than the wine. There are numerous Negociants in Bordeaux with original wood cases of wine more than 100 years old that are in perfect shape. Because most Bordeaux wood cases of wine are close in size and shape, you can easily stack them 10 cases high. But remember, it’s not going to be fun when you want a bottle from the case at the bottom of the stack. If your wines comes in a cardboard box, that box will eventually bend and disintegrate with time. You might want to consider placing your wine in either wood cases of wood racks if you are planning on long term storage. Also, if you are buying wine either for investment, or think you might want to sell the wine in the future, save the original wood case. This can add 10% to the price of the wine, especially if the wine is still in the wood case, or if the case remained unopened. What type of cellar do I need to take care of my wine? Of course most people do not have underground cellars or the space in their home for a proper wine cellar. Fortunately, numerous options exist to allow for individuals to engage in cellaring wine. Dozens of different companies sell home, properly refrigerated cellars that can hold from 10 bottles up to 500 bottles or more. Many wine merchants and stores also offer to rent, temperature controlled wine cellaring facilities that range in price. It’s good to look around based on price and reputation. Remember, most wine will not improve after bottling. But the world’s best wines improve, evolve, soften and develop not only extremely complicated aromatic bouquets, but textures of silk and velvet that are unlike those found in young wine. Those special wines are the wines we cellar. Cellaring your wines is the only way to ensure perfect provenance. Cellaring wine demands patience. But if you are a fan of older, aged wine, the rewards outweigh the cost in both time and money. Take it from me, as someone how has been cellaring wine for close to 20 years, the wines from my cellar offer dramatically better tasting experiences than those from bottles purchased after years in the marketplace. My bottles are younger, fresher and offer a more complete, tasting experience.